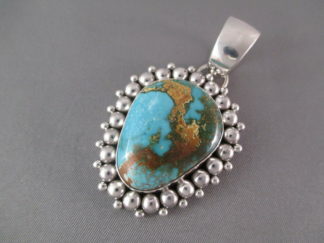 Sterling Silver & Sleeping Beauty Turquoise Necklace! Beautiful hand-made sterling silver bead necklace with lovely little Sleeping Beauty Turquoise accent stones. Made by Native American jewelry artist, Artie Yellowhorse (Navajo). Truly lovely – elegant.